With the beginning of the year I decided it was time to start eating healthier again, and try to work out a bit. And of course it didn't work out well so far because of studying and other things that are going on in my life now. I spend most of the time sitting in bed revising and eating snacks rather than proper meals. I also have the feeling that I don't like anything I used to eat. So thanks to my parents I got a Nutribullet for Christmas. For the past few days I've been mixing up smoothies and milkshakes and trying to drink them rather than going for a bag of crisps. I love fruits and therefore this is a great option for me! 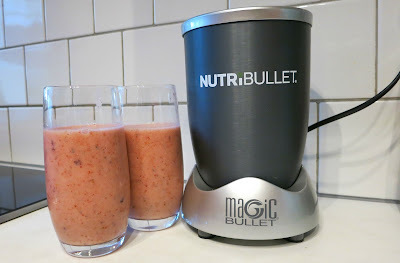 The Nutribullet comes with a book of healthy recipes for the so-called Nutriblasts. I haven't tried out any of those yet because I don't trust the idea of mixing vegetables and fruits together. I will however, try them out soon for sure! There are no strict proportions, I just use the ingredients the way I want the smoothies to taste like. I usually put more bananas and strawberries inside. I throw everything into the Nutribullet and in literally 10 seconds the smoothie is all done and ready to drink! I absolutely love this device! It is also so easy to clean, which is great because the whole process of making a smoothie and cleaning up afterwards takes only a few minutes! There's always a spare minute for that! Have you tried the Nutribullet as well? 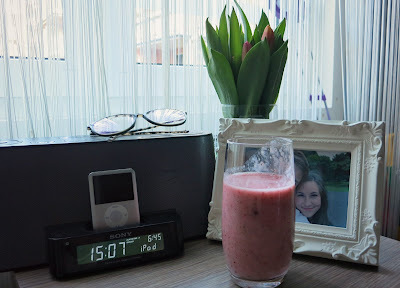 Do you like smoothies? I'm obsessed with them!